Interested in doing an Adult class? Gather four ladies (12+) and we can schedule one that works with your timing. Four classes per session - 7 to 9:30p, $195 per session. *Dates to be determined based on size of class/best days of week for majority of students. IF YOU HAVE A GROUP OF 4 OR MORE, CONTACT LINDA@PROJECTFUNWAY.COM TO SCHEDULE. PROJECT FUNWAY ADULT SERIES, 7 TO 9:30 PM. To register, please email a completed REGISTRATION FORM found on the Registration Page and send a $50 deposit to reserve your spot. Four classes per session - 7p to 9:30p, (or 6:30p to 9p depending on majority), $195 per session. Tu/Th (or could be M/W depending on group's desired schedule). Want to know how to mend that pile of clothing? Put an original hem on your own jeans? Make a professional decorator pillow? Fix the hem on that favorite blouse? Sew on a button properly? Dust off that sewing machine or use one of our machines and come learn the sewing basics. This class is designed for adults (and their daughters) who want to have “fun” while learning to sew. If your high school home economics class was not your style, join PROJECT FUNWAY ADULT to give learning to sew a new twist! This is a practical series created to offer practical skills and mold to what the student wants! 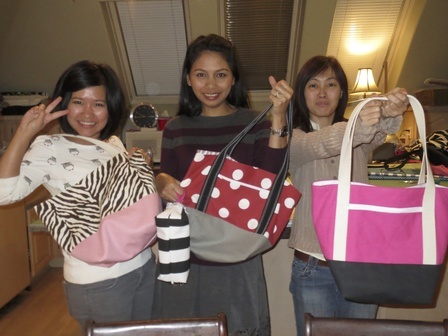 We will be focusing on basic sewing skills and using these skills to create a detailed tote bag that you would be proud to wear (or give as a gift)! As always, we calibrate to the skill level of individuals. After completing the Adult Series I, this class is designed to up your game! We will learn to put an original hem back on jeans, create a designer pillow with piping, learn how to make simple curtains, perfect an invisible zipper, and other gift ideas. Depending on time, we will give help with altering to fit a simple commercial pattern you bring to class. This class is geared for those students who have taken one of our basic classes and has a sewing machine. We will be teaching a variety of gift ideas to sew and re-create for gifts. Instructions and patterns will be available so the student can go home with the "know-how". Pillows, aprons, cosmetic bags, jammie bottoms, ornaments, potholders, shoe bags, scarves, pillow cases, sleeping bag covers, etc, . . . too many ideas - and we will be covering at least 4 ideas! I need to temper my enthusiasm! 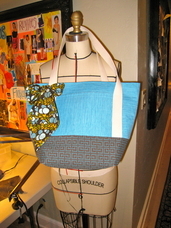 If you have sewing experience and have mastered the basics, you can take this class. I will help you draft an A-line or pencil skirt flat pattern and you will sew it in muslin so that you get the perfect fit for your body. Depending on time, you will be able to sew up a skirt in cotton with facing and/or lining, invisible zipper, and kick-pleat. You will have the skills to knock out a beautifully lined skirt for the holidays - JUST YOUR SIZE!